Greentree is locally owned and operated in Greenville, SC. Our specialties include risk assessment, diagnosis, treatment, preservation, appraisal, forensic investigation, litigation & education. Upon leaving a distinguished tour with the Marines in ’88, Randy Cyr started Cyr’s Tree Service in Jacksonville, NC. Logging and gardening with his father in northern Maine gave him his passion for trees; studying Arboriculture at Lancaster University, and Natural Resource Conservation at the University of Maryland, the education he could draw upon. It wasn’t long before Randy set himself apart as the area’s first Certified Arborist, as well as enjoying the sole endorsement of Mayor George Jones and Sheriff Ed Brown. Randy would go on to become an ASCA graduate, a Certified Tree Risk Assessor, and the Upstate’s first Board Certified Master Arborist. In the fall of ’96, when many Upstate tree services were cleaning up the remnants of Hurricane Fran, Randy moved his company to Greenville, SC (leaving behind his tree removal equipment), and changed its name to Greentree, to reflect its new direction. Randy brings to the Upstate a rare and refreshing repertoire of experience, integrity and customer courtesy. While other companies target the removal of trees and tree parts, the professionals at Greentree have taken what they’ve learned through decades of research and practice, and focus upon preservation. 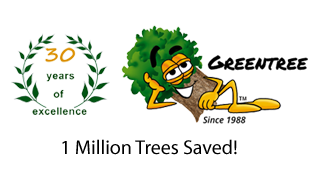 They accomplish this through education, consultation and treatment services, catered to meet the tree care needs of the Upstate and beyond. We won’t make a recommendation before conducting a thorough Health Diagnosis. Treating secondary symptoms before finding the primary source is a waste of money, and may even make worse the problem. We won’t conduct a Health Diagnosis before performing a Level 2 Tree Risk Assessment (Hazard Evaluation). Why treat a tree today that could fall on your home or office tomorrow? Since we don’t do removals, you needn’t worry about an offer to remove a tree that can be saved. If your trees cannot be made safe and healthy and require removal, we can make an impartial recommendation. Since we are not affiliated with any other company, and do not receive or pay referral commissions, we are free to refer companies that have proven to be competent and ethical. Should you have a grievance with a company we have referred, we will intercede on your behalf. They will make it right, if they wish to continue receiving referrals from us (we are the closest to a watchdog in the Upstate). The majority of our recommendations require no further action on our part. A simple DIY solution (cultural practices), such as watering, mulching or fertilizing, may be all that’s needed. Should your trees require therapy, instead of the typical one-time, ‘hit or miss’, cure-all, we employ our own, 5-tier treatment program that has proven 99% effective! See Greentree’s Before & Afters. Our objective is that, once your trees are safe and healthy (with periodic monitoring, and cultural practices in place), they become self-sustaining, rather than codependent upon a tree or lawn care service. Bottom Line: We’re going to save you a lot of money!